Healthcare. We Care — for 20 years. We are committed to providing high quality, affordable products responsibly to all our customers and, in pursuance of this, products are manufactured and distributed in accordance with the applicable regulations, legislation and guidelines governing the pharmaceutical industry. We do this with integrity and with commercial wisdom, striving to enhance the economic and social wellbeing of our stakeholders. We believe in constructive engagement and communication with our identified stakeholders. In doing so, we undertake to provide information which is truthful, relevant, accurate and consistent. 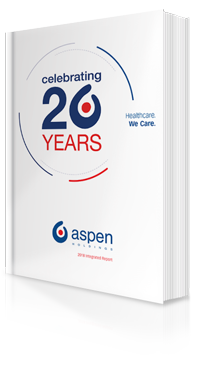 Aspen's SED programme primarily supports the establishment of clinics, healthcare programmes, educational programmes, community programmes and charitable initiatives which are targeted at addressing the shortage of primary healthcare in South Africa. In addition, all our employees are encouraged to devote at least 67 minutes of their time to the Mandela Day initiative. Aspen's strength lies in its worldwide team of more than 10 000 employees who work in a trusting environment, free from discrimination, prejudice, bias, harassment and violation. Employee rights and labour regulations are respected through human resources, industrial relations and legal compliance frameworks implemented throughout the Group. The Code of Conduct is available online. A formalised ethics management programme is implemented annually throughout the Group and is managed by the Company Secretary & Group Governance Officer under the direction of the S&E Co and A&R Co.
We endorse the ethical marketing of medicines and have implemented the Aspen Code of Marketing Practice which prescribes certain minimum standards aimed at ensuring that any promotional activities and interactions with healthcare professionals and other affected stakeholders are carried out in a responsible, ethical, professional and legal manner. All stakeholders are encouraged to report unethical conduct and other transgressions of our Code of Conduct and policies that they may become aware of and an independently monitored whistle-blowing hotline is available for this purpose. This hotline may be contacted at aspenpharma@tip-offs.com or on any of the regional telephone numbers for this line as listed online. Our manufacturing and supply protocols promote the ongoing review and continuous improvement of operating policies and procedures in an effort to deliver high quality products to the market responsibly, on time and at competitive prices. In doing so, cognisance is taken of developments in environmental legislation, technological enhancements relevant to the Company's operations, resource conservation systems and environmental management guidelines. "To deliver value to all our stakeholders as a responsible corporate citizen that provides high quality, affordable medicines and products globally", encapsulates the Group's inherent approach of conducting business ethically, with integrity and with a commercial wisdom which strives to enhance the economic and social well-being of our patients, consumers, investors, employees, customers and business partners.